I was thinking of a dessert my grandmother always used to make and it brought back some wonderful memories of when my older sister and I would help her at her Bed & Breakfast. We were young, maybe 10-12 years old, and she would pay us to help serve the guests. It was such a fun way for us to learn responsibility and the guests always seemed to be amused and impressed watching us in our little aprons and uniforms. I loved listening to grandma plan the dinner parties over the phone and peeking over her shoulder when she was finalizing the menu. She had the choices plastered on the side of the fridge and my sister and I knew we would always get an extra special dinner that night – the leftovers from the party! My favorite was the crab stuffed chicken and scalloped potatoes. There were several dessert choices too and her Frozen Pink Lemonade Pie was among one of her most popular for repeat guests. I included the instructions to make a pie instead of sandwiches in the notes below. I distinctly remember one large party that two desserts were chosen. She made her famous Chocolate Decadence and this pie. We were all shocked when she ran out of the Pink Lemonade Pie. I mean, who chooses that over Chocolate Decadence? It was a warm day and guests were just in the mood for something lighter than chocolate. It always made me laugh though because I will never forget how horrified she looked when we ran out! 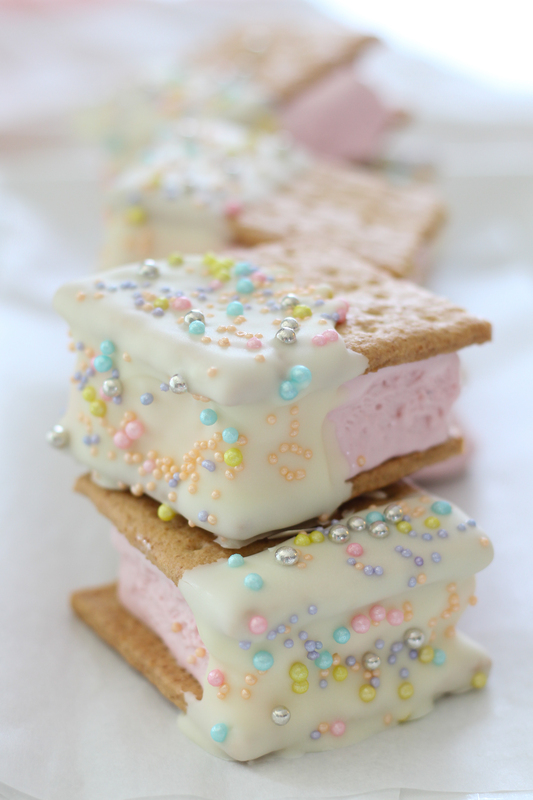 I added a twist to her recipe and decided to try to make a fun summertime treat. I have to warn you, making these into sandwiches is a bit more time consuming and the best kind of messy but they are so cute it is worth it. This would be a fun thing to have the kids make too and each can decorate their own. Notes: To make this as a pie pour the filling into a graham cracker crust and freeze. Add sprinkles and additional whipped topping, if desired. Omit the white chocolate or pour a little in the crust prior to the filling. 1. Line a 9×9 inch cake pan with plastic wrap and set aside. 2. In a large bowl whisk together pink lemonade concentrate and sweetened condensed milk and a drop of gel color (if using). Fold in the whipped topping until lumps are gone and it is smooth. 3. Pour into the plastic wrap lined cake pan and smooth. Place in freezer overnight. 4. 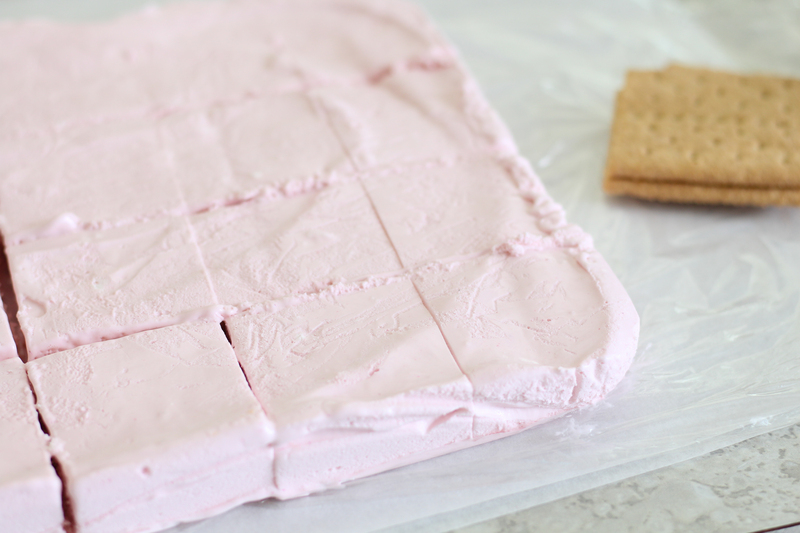 Cut graham cracker sheets in half for a total of 24 squares. 5. Working quickly, remove pink lemonade filling from freezer and turn out onto another sheet of plastic wrap. Cut into 12 squares. I found that removing each square using a small spatula and turning it onto a graham cracker worked best for me. Top each to make a sandwich and place on a parchment lined baking sheet and immediately return to the freezer for at least 30 minutes. 6. When you are ready to dip the sandwiches, first prepare your area so you can work quickly. 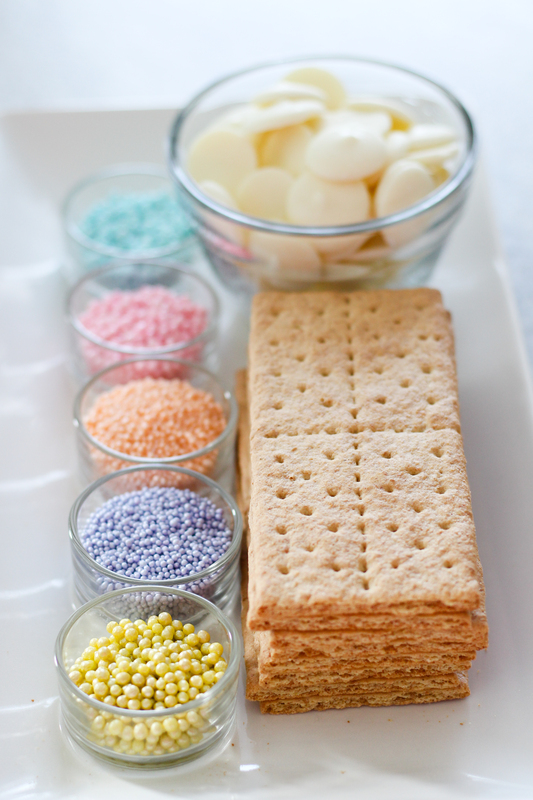 Place sprinkles in a small bowl(s) on top of a rimmed baking sheet and have a few paper towels nearby – trust me, it gets a little messy! 7. Melt wafers according to package directions. Remove half of the sandwiches from the freezer and dip one end about a third of the way in, covering each side. 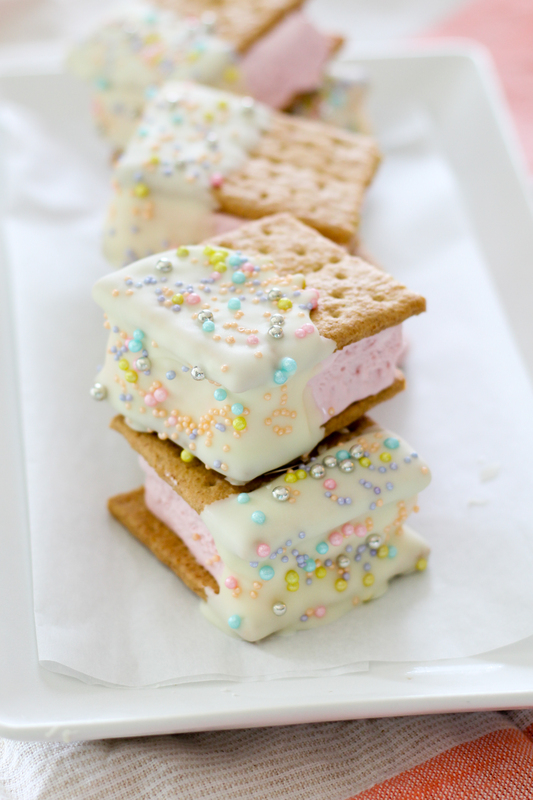 Immediately add sprinkles and place back on the sheet to return to freezer. Repeat with the second half. 8. Store in the freezer. 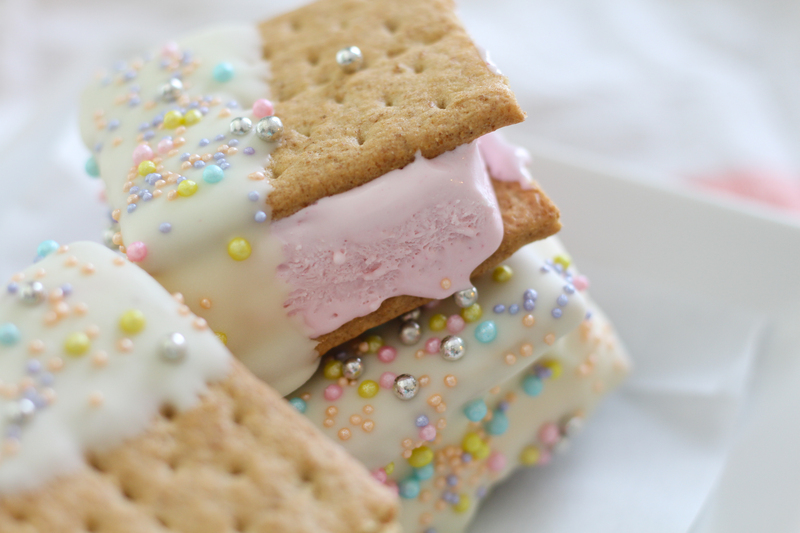 This entry was posted in Brownies & Bars, Other Desserts, Pies, Vegetarian and tagged frozen, pink lemonade, summer. Bookmark the permalink. These are GORGEOUS! I love reading your memories of your grandma! These would be great for a bridal shower or a ladies luncheon! So beautiful, will give it a try.